It’s that time of year. People are making their New Year’s resolutions. For some, it’s the age-old resolution of weight loss. For some, the goal is more exercise or less Facebook time. Some have even committed themselves to reaching a professional goal with a career change. Just like any New Year’s resolution, going back to school for a career change takes planning, hard work and dedication. The decision to make a career change rarely happens out of the blue while someone is peacefully typing away on their computer at their job. In the movies, we see the main character have an instant revelation to make a career change, open up a bakery and make delightful little cupcakes. However, in the real world, it doesn’t happen that way! Career changes usually take place in difficult situations. Any employment section of a magazine or newspaper is read more often out of need and economical reasons than inspiration. The desire to provide for a family, set an example for children, or a strong interest in a specific field can lead some to commit the time and hard work to make a career change. Ready to Make a Career Change? Tossing around the idea of changing careers? Start out with what may seem like an easy question – ask yourself why you really want to make a career change. Is it for economic reasons? Are you seeking a lifelong career, not just a job? Next, ask yourself if you can commit the time and hard work needed for a program. Check to see how long the program is and if it has flexible class schedules that could allow you to continue with your current job and family responsibilities. Amina Harley decided to make a career change and graduated from Dawn Career Institute’s Pharmacy Technician program. For her, the decision came from her desire to make a future out of her career. Getting Started: Like Harley, many adults who are returning to school or going to school to prepare for a better career want a specific type of education. They are not in school to take unnecessary general education courses or to take in the “college experience.” They need career-specific education that can give them the knowledge and skills they need to move into their future career quickly. Many of Dawn Career Institute’s programs are designed to equip students with skills that are immediately applicable to their future career. Look for a program that can give you the specialized career skills and knowledge you will need. This can help you stay focused on your goal and give you the ability to reach it within a reasonable period of time. 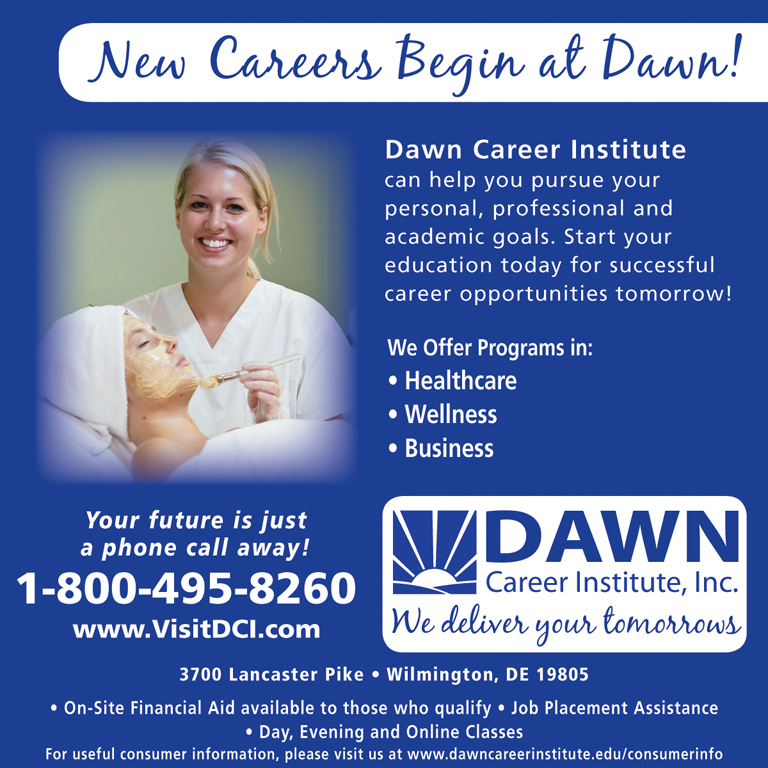 If you’re interested in a new career, Dawn Career Institute may have the right program for you. Dawn Career Institute offers day and evening classes at its campus in Wilmington, Delaware, and online. In programs that can be completed in as little as six months, you can learn the essentials to qualify for a job in one of these fast-growing professions. Dawn Career Institute offers job placement assistance to all its students, and financial aid is available to those who qualify. Dawn Career Institute also offers the following programs: Esthetician (Skin Care Specialist), Massage Therapist, Personal Fitness Trainer, Medical Assistant, Medical and Dental Biller/Health Insurance Claims Examiner, Medical Administrative Specialist, Nurse Assistant, Pharmacy Technician, Dental Assistant, and Legal Assistant. Dawn Career Institute is accredited by the Accrediting Commission of Career Schools and Colleges (ACCSC). For more information, go to www.VisitDCI.com or call 1-800-495-8260. About Dr. Salamat Hussain, Dean Of Academic Affairs at Dawn Career Institute. 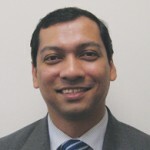 Dr. Salamat Hussain is a physician originally from Bangladesh who holds a Master of Science degree in health services management from Argosy University. He has a long history in education as an instructor at Asher School of Business in Norcross, Ga., the dean of academic affairs at Brown Mackie College in Atlanta, Ga., and the director of education in Norfolk, Virginia. Today, Dr. Hussain serves as the dean of academic affairs at Dawn Career Institute in Wilmington, Delaware. Dr. Hussain is passionate about teaching, learning and student success. He is deeply committed to improving the lives of DCI students and believes learning truly is a lifelong process.